The circle of the Paneurhythmy is a small version of the vast world circle, along which the forces of the macrocosmic life flow. It conceals in itself the idea of the Divine Awakening of life, of the four seasons, the joy of giving and all the conditions, man goes through in his life. Paneurhythmy is the science of accepting the sensate motions of nature. In paneurhythmy man meets and adopts the Divine, the powerful, which is the structure of the Universe, and goes to work for the great concept of life. Paneurhythmy is the harmonic creative expression of the Divine principle of the Universe. Paneurhythmy brings life, power, joy and beauty to human soul. The body has to be upright. Bending shows that you have two centers, one towards the Earth, and the other – towards the Sun. If you bend, you’re in union with the Earth. Earth’s center dominates, and that is why a curved line is formed. Things are not going well. You should be standing straight, so that your center is the Sun. You should learn to step first on your toes, and then on your heels. In this way you’ll avoid any shock on the spine. The exercises are performed neatly, with stretched extremities, smoothly, but don’t do ballet, but dance. If you hold your legs loose, you won’t have any contact with the forces of nature. That is why your legs must always be straight, expressing will. If you raise your arm up and don’t stretch it, you won’t have any contact with the Sun. You must step orderly, so that you connect to the currents, which come from your left and right. An exercise is beneficial only if you have contact with the vital forces of nature: with the forces of the Earth and the Sun. The fingers must not be outstretched, but held together. Legs and arms are two opposite poles and they play a very important role. A man, who does not know how to control his arms and legs, cannot achieve anything big. Head is situated between the two poles. It is the center. If you move your hands correctly, you’ll be able to deal with the human kind reasonably. If you move your legs correctly, you’ll deal with the animal world properly. If you move correctly your spine and the muscles, connected to the spine, you’ll know how to deal with the plant kingdom, to obtain juices from there. Each muscle, each nerve, each cell must be set in motion. The exercises have to be performed in concentration. When you perform the exercises, you should not look or think what the others do, but be focused on what you do. Your thoughts must be present in your hands and arms, in your feet and legs, it must be present in every cell of your body. Thought, feeling and motion are all important. Thought gives form, direction to things, feelings provides the content and motion – the garments, which are needed to express them. Though and feeling must take part in every motion and penetrate every cell. The paneurhythmy exercises are like an anteroom to the Divine World. Some of the exercises of the paneurhythmy are part of the Divine world, others – of the spiritual, and thirds – of the physical world. Learn to perform them correctly. Study the exercises step by step, drop by drop, so that you master them, practice them plastically, and never sharply, abruptly. A lot of energy is lost in abrupt motions, they have a completely different nature. When performing exercises, you must constantly keep in mind that they are for your benefit. Exercises play an important role in rejuvenation of man. If you practice them correctly, you will at least remove the wrinkles from your face. The Master worked on Paneurhythmy between 1934 and 1942. The elaboration of the rhythm, melody, motions and lyrics and their application was a long and complex process. Paneurhythmy was offered by the Master as a high ideal of the Bulgarian spirit, it is in harmony with the Bulgarian ethnic songs, the steps of the Bulgarian round dances (“horo”), the specificities of the Bulgarian environment. Paneurhythmy is bonded by internal harmony and common laws. An exchange of forces of man and nature takes place during its performance. At first exercises with melody, motions and lyrics were created, then the Pentagram was developed, followed by the “Rays of the Sun”. 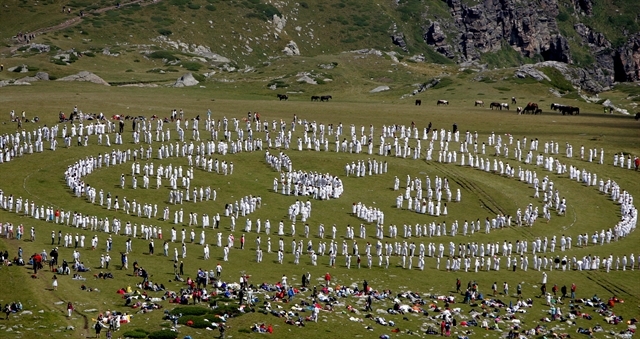 Paneurhythmy is performed in the morning between 22 March and 22 September and consists of 28 exercises – parts of the Paneurhythmy, the Rays of the Sun and the Pentagram. They are performed immediately after the other with short pauses. 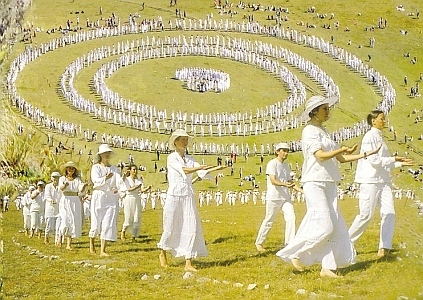 The first ten exercises – “Awakening”, “Conciliation”, “Giving”, “Ascending”, “Elevation”, “Opening”, “Liberation”, “Clapping”, “Cleaning” and “Flying” – are performed without interruption, as a whole. They relate to the physical field and help to overcome the inertness of physical matter, escape the life of the third dimension and enter the fourth – the dimension of the agile astral matter. The ten exercises cover the first two steps of human development, which the Master calls “turning to God and penance”. 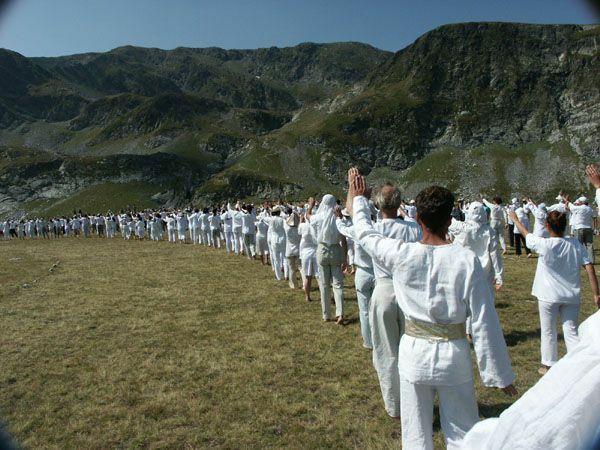 The next ten exercises – “Evera”, “Jumping”, “Weaving”, “Thoughts”, “Aum”, “The Sun Rises”, “Square”, “Beauty”, “Agility”, “Winning” – signify the next two steps of development, referred to by the Master as “Salvation and Revival”, i.e. man exists the lower astral field of temptations. The next eight exercises – “Joy of Earth”, “Introduction”, “A Fine Day”, “How Pleased We Are”, “Step by Step”, “In the Early Morning”, “Breathing” and “Providence” symbolize the path of the revival of the soul, the fifth step of development, which the Master calls “New Birth”. In this field the Master subdues his private life to serving the society, the whole. Paneurhythmy is a supreme synthesis of the spiritual principles and methods of Master’s School, of their application and development. Significant attempts have been made, especially after 1989 to incorporate Paneurhythmy in the Bulgarian school program, but for one reason or another, these efforts have so far proven fruitless.